Ruby Walsh was the punters pal again as he gave the favourite Hedgehunter a masterful ride to make amends for last year's last-fence fall. He hunted up the leaders just off the pace throughout before taking it up with three to jump, and from then on was always in command. He had the luxury of a look round at the elbow before sauntering home clear of Royal Auclair, Simply Gifted and It takes Time, with Carrie Ford a gallant fifth on Forest Gunner. Once again though, the race managed to elude Tony McCoy who was leading the field when hampered by a loose horse at Bechers. The champion was unseated and made to rue his luck once again. Of the other fancied runners, Strong Resolve made a mistake at the water and was never able to recover, while Double Honour was prominent when falling, and Gold Cup second Take The Stand suffered the same fate. However, 21 of the 40 that set out made it safely back, with Nil Desperandum 6th, Innox 7th, Heroes Collonges 8th, Just In Debt 9th and Amberleigh House 10th, notable finishers. Ruby Walsh also won the National on Papillon in 2000 and has many more years left to add to that brace of victories in the world's most famous race. Breeder: J A Keogh Breeding: b g Montelimar (USA) - Aderedw Tote Win: £8 Places: £2.60, £13.10, £13.40, £4.70 Exacta: £612.70 Dist: Distances, 14, hd, 4, 9, 0.5, 11, 3.5, 2.5, 5, 1.5, 1, 1.25, 9, 15, 5, 6, 16, 17, 21, 19 S39. Born May 14, 1979, and based in Co. Kildare, Ireland, he is the son of 11-times Irish amateur champion jockey, Ted Walsh, who is now an established trainer and television pundit. Ruby is the second of Walsh’s four children, and is associated with the powerful stables of Willie Mullins in Ireland and Paul Nicholls in Britain, having spent time with Noel Meade and Aidan O’Brien. Walsh coasted home as the champion Irish National Hunt jockey in 1998/99 in his first season as a professional rider, winning 96 races in the process, and regained the title in 2000/2001 with 85 successes. He had previously followed in his father’s footsteps, finishing champion amateur jockey at the age of 19 despite still studying for his Leaving Certificate. He was injured in a fall in October, 1999, in the Czech Republic, fracturing a leg which kept him out for five months until March, 2000, and less than a month later won the John Smith’s Grand National on his first ride in the race on Papillon, trained by his father. Later in the same month Walsh picked up a Grand National double when partnering Commanche Court to victory in the Irish equivalent. He finished fourth on Papillon after remounting in the 2001 John Smith’s Grand National and was again fourth last year on Kingsmark. Walsh, who is based in Ireland but flies over to partner most of Nicholls’s runners, was leading rider at last season’s Cheltenham Festival, where his successes were headed by Azertyuiop in the Queen Mother Champion Chase. This season he has ridden 100 winners in Ireland for the first time as well as winning the Welsh Grand National on Silver Birch, Thisthatandtother in the Daily Telegraph Chase, the Game Spirit Chase on Azertyuiop and the Peterborough Chase on Le Roi Miguel. 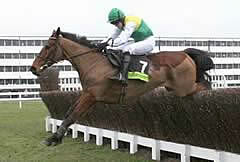 Grand National Record: 2000 PAPILLON (1st); 2001 Papillon (4th); 2002 Kingsmark (4th); 2003 Shotgun Willy (PU bef 22nd).